Corrugated packaging manufacturer, Unipak Nile, satisfies customer and market needs for effective packaging to protect plug and socket products during transport. A customer approaches Unipak Nile and requests a packaging solution to ship power sockets from Egypt to Europe without damaging the product. Challenge: Decorative lighting manufacturers face packaging problems when transporting power plugs and sockets. 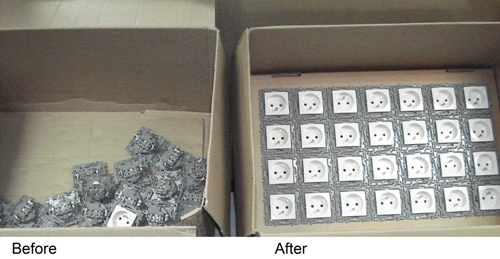 Conventional packaging damages products by packing plugs and sockets in corrugated boxes with merely a pad to separate the layers. This results in disorganization and friction between the plugs and sockets. 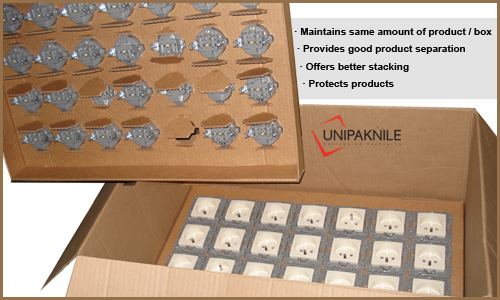 Unipak Nile design team developed an efficient and effective corrugated packaging solution to protect and organize power plug sockets. The new customized and innovative product design integrates perforated corrugated pads to manage and firmly hold in place sockets. Once cut, each perforation on the corrugated pad creates a carton flap that acts as a partition between sockets. These flaps offer stacking strength and protect the product from damage by ensuring that sockets are not loose and do not collide or scratch. Furthermore, the packaging solution maintains the same amount of sockets per corrugated box. Result: Based on Unipak Nile’s design success, the customer increased business and requested the same packaging design for six other types of products. Established in 1996, Unipak Nile manufactures shelf ready packaging, promotional boxes, point-of-purchase (POP) displays, bag-in-box (BIB) cartons, corrugated base wrap, corrugated boxes, and corrugated trays for the beverage sector. The corrugated packaging manufacturer also serves the agricultural, catering, chemical and petrochemical, dairy, food, hygiene disposables, industrial, paramedical, soap and detergent sectors in Europe, the Middle East and Africa. Unipak Nile is ISO 9001, OHSAS 18001 and HACCP certified. Unipak Nile is a member of INDEVCO Paper Containers, a division of INDEVCO Group.